One year after its debut album, the Russian pagan folk metal band Стожар (Stozhar) is back with its second full-length work, entitled “Слава Πеруну!”. Formed back in 2005, this band from Yaroslavl suffered a lot of line-up changes until 2010, when things became more stable. The only remaining member from the early line-up and the 2005 demo “Языческая Русь” is Yarosvet, who was also one of the band’s founders. After a lot of work, Стожар managed to sign a deal with the Russian label Stygian Crypt Productions and finally released their first full-length “Ни Шагу Назад” in 2013. On June 2014 they returned with their newest album, released again via Stygian Crypt. There might be only one year distance between the two albums, but the differences are very important. I already liked a lot their debut album, where the band experimented with various metal styles and its sound was moving from epic metal to folk metal, melodic metal and pagan black metal with great changes between each song. This time the band decided to combine all its influences in a more solid result and their new sound is now much closer to Slavonic pagan folk metal. Furthermore they improved their production and enriched their orchestrations, while the coming of Evgenia with her beautiful female vocals brought a much better balance in their music. “Слава Πеруну!” consists of 9 songs and its total duration is once again just a little over 34 minutes. The band continues to use many traditional instruments like bagpipes, violin, flutes and accordion, this time with a more natural and organic sound. The basic difference is that now the Slavonic folk tunes have also affected their guitar playing, so their “marriage” with the acoustic instruments is much more “smooth”. They dare to experiment with some electronic instruments too, combined very discreetly in their sound, helping them to create a unique atmosphere. I’d say that the overall mood of the album is quite uplifting, still retaining the band’s epic pagan atmosphere. Evgenia’s vocals have the leading role in most of the songs, singing either in folk, epic or in aetherial atmospheric style. 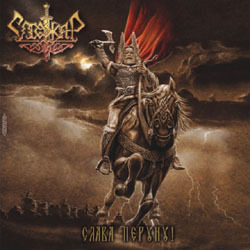 Apart from the addition of female vocals, Стожар have also improved a lot their male vocals, which are mostly pagan black metal screams this time. Their lyrics are of course in Russian, dealing with local legends and folklore. Стожар have released a very good folk pagan metal work, recommended to all fans of the genre. They managed to filter all their influences in a really solid album with very interesting balances between their raw natural epic sound and a clearly improved production, something that makes them distinguish from the typical over-repeated sound of the genre. Of course they still need work, mostly in the overall sound production in my opinion, but the steps forward they already made are huge. “Слава Πеруну!” is released via Stygian Crypt Productions in a standard jewel-case CD edition with 16-page booklet including all the lyrics. Cover artwork is by Igor ‘Ozhiganov, while design and layout by Alastor of Scratching Soil. You can visit their official pages below for further details and sound samples.